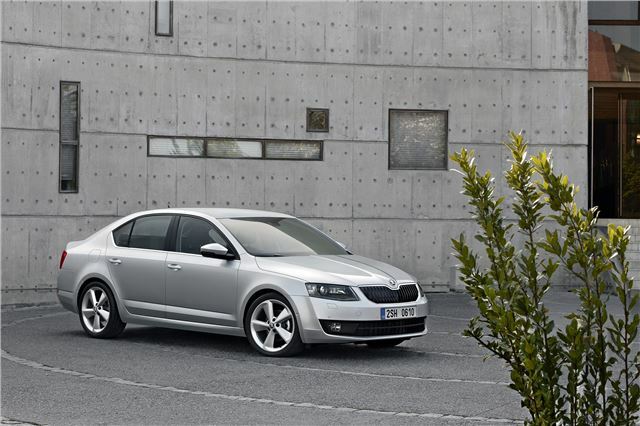 Skoda has taken the wraps off the new Octavia, which is due in showrooms in the first part of 2013. The first pictures of the new car show that it has gone more upmarket and is more sharply styled. It's larger too, as it's had to make way for the new Rapid, which now slots in under Octavia in the range. Skoda claims that no other car in the compact segment offers more interior length (1,782 mm), more knee room (73 mm) or more headroom at the back (980 mm). The firm is also claiming a best-in-class is boot volume with 590 litres. It's also packed with technology, most of which we have seen in similar models that share the same underpinnings - namely the SEAT Leon, Volkswagen Golf and Audi A3. Stand-out pieces are the safety systems, with Lane Assist, an in-town emergency braking function, automatic parking, adaptive cruise control and tiredness detection all available. Other, more conventional safety systems, include nine airbags and two ISOFIX points in the back. There are also clever design touches that have in recent times become Skoda's design signature. That means there's a double-sided floor covering in the boot (one side is wipe-clean for mucky items), an ice scraper inside the filler flap, a warning vest holder underneath the driver’s seat and a rubbish bin inside the door panel. More importantly there's a fuel-error prevention function to help stop mis-fuelling. Some of these items will be standard, some will be optional, depending on the version you choose. Keyless entry and a panoramic sunroof (a first on an Octavia) will be available on higher spec cars. Engines from launch are the 1.2 TSI with 105PS and a 1.4 TSI with 140PS. Plus a 1.8 TSI with 180PS will follow later. The diesels will be a 2.0 TDI with 150PS and a 1.6 TDI with 105PS that will also be a headline-grabbing 89 g/km Greenline version. Engineers have managed to reduce the Octavia's weight by 100kg over the outgoing car, so there's the potential for it to be better to drive than ever. Prices, specification details for the UK and information on estate and vRS models have yet to be announced.